Our results of – choosing a breed or breeds, sourcing fleece, roving, and/or yarn, spinning for some, designing, and weaving. Leicester Longwool, Cotswold, Dorset Horn, Lincoln, Oxford, Black Welsh Mountain, Clun Forest, Shetland, Shropshire, and Southdown. impressed with the variety and creativity of the participants. Absolutely! A huge amount of talent went into creating these tiny works of art. Congratulations to all concerned on a job very well done. Question: Has this project been documented; i.e., types of yarn used, where and how obtained, who did what and why, etc., etc?? Truly believe this should become part of NOBO’s recorded history. Thanks for sharing these pictures, Margaret. But most importantly- thanks for thinking of this project. I learned a lot about my breed and everyone else’s as well. The following is our exchange documentation, collaboratively compiled by Melissa and Margaret. Participants – please feel free to add to or edit your information. The American Livestock Breeds Conservancy’s Conservation Priority List for 2009 identified eleven British sheep breeds, one of which was a hair breed. With this in mind, eleven members of the NOBO (North of Boston) Handweavers Guild decided that an exploration into the wool breeds would be both fun and educational. To keep things reasonable, we agreed that a bookmark exchange made sense and would result in each participating member walking home with a full compliment of woven samples. Our bookmarks are woven from the following protected breeds – Leicester Longwool, Cotswold, Dorset Horn, Lincoln, Oxford, Black Welsh Mountain, Clun Forest, Shetland, Shropshire and Southdown. Inspiration came from many sources, including Handwoven Magazine, Wild Fibers Magazine and even the personal, handwritten pattern book of 18th century English weaver Timothy Bent. Many of us found that sourcing the wool was the highlight of the project, and some of us even roamed with the very sheep that provided our yarn. Each participant in the exchange chose a primary breed or primary and secondary breeds. When possible, fleece, roving or yarn was sourced directly from farmers and all fibers originated in the U.S. 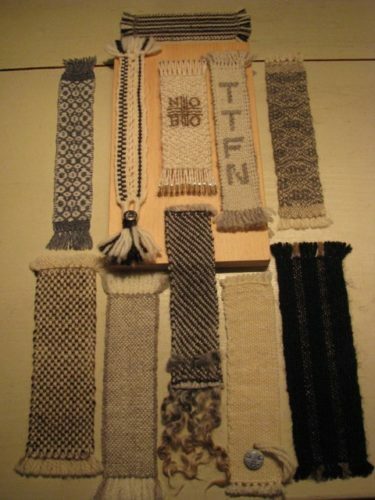 The use of naturally colored wools was encouraged and bookmark design was the choice of each weaver. When I decided to participate in the bookmark exchange, I had no idea how much discovery and exploration I was in for. I already had a skein of silver/slate Cotswold yarn. I purchased it after reading an article in Wild Fibers Magazine about the nuns in Washington state who tend that historic breed – the Black (colored) Cotswold. What to combine it with? A fall vacation in Stowe, VT brought me close enough to a shepherdess whose flock included Dorset Horn. The only problem was that she sold the roving, but no yarn. Since I had only briefly used a Turkish style drop spindle, I was reluctant to spin it myself. A friend in Maine came to the rescue and spun a goodly amount. Now on to the pattern: a small bookmark seemed an ideal opportunity to try something new. I settled on double weave pickup, but had no idea how to do it. NOBO Handweavers’ helpful librarian actually had a part in solving the dilemma when I borrowed a 1993 issue of Handwoven Magazine (she always encourages us to borrow resources from our guild library). In that issue, I stumbled across an article about double weave and Finn weave. So far, there are many hands weaving this “small project”. I’ve thought about how our ancient craft of weaving has married so well with today’s computer technology. What would we do without our email exchanges, internet sharing, and computer software, not to mention our smart phones? So it seems appropriate that my bookmark should reflect this happy union. “TTFN” – Ta Ta For Now! Perhaps the journey of discovering Shropshire and Oxford yarn sources was the most rewarding. Not knowing where to begin, I took the US Shropshire Registry and emailed anyone that had listed an email address. If they had websites listed, I went to their site. Apparently Shrops make a great Sunday roast, as most were raised for their meat. After emailing all the members of the US Shropshire Registry, I received 3 replies. The first 2 had no fleece or spun yarn, but the third came back with a positive reply from Kindred Crossings Farm. Yay! The yarn is a beautiful rich butter color, millspun, worsted weight and I am so thankful to have received it. It is wonderful to work with and I believe Kindred Crossings Farm will be a source for future use. This yarn is gorgeous, beautifully spun, and a joy to work with. Both fibers were handspun by me from “in the grease fleece”. My warp consists of five stripes, three sections of Black Welsh Mountain, heavy worsted weight, Navajo plied, separated by two sections of Shetland, tan, 2 ply lace weight. The effect creates raised sections of Black Welsh and flatter sections where the Shetland is warped. Weft is Black Welsh singles, sport weight. I wanted the quality of the sheep to be primary. I purposely left some vegetable matter in the fleece when processing as a reminder of its origin. The goal was to showcase the yarn, not the weaving. From the very first time I heard about the Clun Forest breed of sheep, I was intrigued. These sheep originated from the hills and forests around the old town of Clun in the Shropshire region of England. In the 1970’s, Tony Turner imported the first flock to North America via Nova Scotia. My Cape Breton roots run deep, so that immediately appealed to me. I was also drawn to the fact that Clun are excellent mothers and their wool is a pure, creamy color. It spins and weaves like a dream. In a bit of serendipity, there is a Clun Forest breeder located just two miles from my in-laws in Groton, NY. Mary Gloster of Rocky Top Farm graciously showed us around the farm and allowed us to roam with these wonderful sheep as they pastured in their field. Now, I’ve gone from “Clun Forest?” to “I want Clun Forest!”. I used a little wool from every participant so I could weave bookmarks that would offer various combinations of all the breeds represented. Warp yarns: Black Welsh Mountain, Clun Forest, Leicester Longwool, Oxford, white, light brown, and dark brown Shetland, Southdown. Weft yarns: Black Welsh Mountain, Clun Forest, Cotswold (white), Dorset Horn, Southdown, Leicester Longwool (handspun), Lincoln Longwool, Oxford, white, light brown, and dark brown Shetland, Shropshire, Southdown. Last winter a friend and fellow fiber nut asked to do a collaborative project. She proposed handspinning fiber if I would weave the handspun into two scarves, one for each of us. Accepting her offer, I began searching for local fiber farms, intent on having an all-local scarf. While reading EDIBLE BOSTON, I found Spencer Brook Farm in Concord, MA. Their lustrous rare British breed white Cotswold fiber is one of several fibers collected for the scarf project. When the NOBO bookmark exchange began I already had the fiber, unwashed as it was, but perfectly suited to this second project as well. I wanted to weave my bookmarks one at a time, as a mobile project, with as little rare breed waste as possible. My as yet unmade shoe loom (a slab of wood with a few brads) was all the loom I needed. Plain weave proved too sticky but a simple yet elegant 2/2 twill did the trick. My secondary fiber choice was Melissa’s handspun tan Shetland. I wanted the bookmark to be handspun as well as handwoven. The medium dark tan Shetland singles was used as embroidery floss to brand our guild logo onto my bookmark. I chose Shetland sheep because most breeds were already spoken for when I joined the swap. Shetland was chosen as a secondary fiber quite a bit, but was still available as a primary choice. At one time I had looked into raising them. Their wool is soft, fine, strong and just beautiful. Their wool comes in so many different colors I didn’t feel like I needed a secondary breed. I wove with moorit, white, and black Shetland. Robert Bakewell was an 18th century agricultural revolutionary from Leicestershire, an area in Midlands England. He was responsible for the evolvement of the Leicester Longwool breed. While using Leicester Longwool, I also wanted to weave my bookmarks using a pattern from an 18th century English weaver. Timothy Bent was from Bristol, England and “The Rose & Diaments” is found among sixty some drafts in his personal, handwritten pattern book dated 1778-1795. Lisa Westervelt spun three colors of Leicester singles from her flock – white, dark grey and the rarer silver-grey known as “English Blue”. I chose Lincoln because I was intrigued by the longwool breeds. Lincolns, imported from England to the US in the 1800s, have lustrous curly locks and the wool grows up to 12″ per year. I was glad to support a breeder close to Massachusetts, Donna Foley of Four Directions Weaving in the Adirondacks, who had lambswool custom spun as 2-ply yarn. I chose a 2/2 twill to show off two contrasting natural colors along with locks as an unusual fringe. I didn’t choose Southdown, Southdown chose me. I was a latecomer to the exchange group and they needed someone to take on Southdown and I jumped in. It has been a pleasure to both spin and weave. The cream colored Southdown was handspun from roving I purchased from Dehn’s Southdown’s and used for weft. I already had the grey Shetland and it was used for both warp and tabby weft. I found the weave structure in The Handweaver’s Pattern Directory. I knew I wanted to do an overshot pattern and found one that was worked over twenty warp ends. I added two floating selvedges bringing the total to twenty-two warp ends. Thank you for putting this together. I loved reading it! Can’t wait for our meeting on Thursday.